Our sweet girl is three months old. I feel busier now than I did six weeks ago, strange though it may seem. I guess it is partly because I am now able to get out more with Junah and so my expectations for what I can accomplish have grown. Things don't always get done, though. There is always laundry, especially since we're using cloth diapers. Sometimes I manage to get the dishes done, but while I'm making dinner, so the dishes pile right up again. My husband does as much as he can while working six days a week. He is still the cleaner of the bathroom for which I am very grateful. And the fact that I am still home with my daughter means so much to me, and it is a gift that he is giving to our family. with my knitting acquisitions last month. never again make socks that are handwash only. Too much work (for the sock washer). the poor woman's Manos, I've got to try the real thing. Three skeins to make a winter sweater for Junah. to redo what I've got done because it just doesn't look good. scarf from Last Minute Knitted Gifts. and a color card for the Blue Sky Alpaca Organic Cotton. 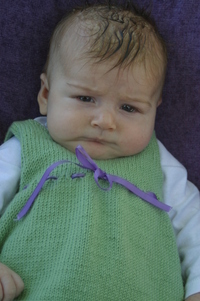 So, all of those purchases and here it is, a month later, my daughter is now sixteen weeks old, and what have I done? Still not sewn up the cardigan, worked a few rounds on the pants, and let pretty much everything else languish while I increased another stash. My fabric stash, that is. I've been sewing. And loving it. My little diningroom, or a third of it, to be more accurate, has been transformed into a sewing room. My sewing machine is sharing space on our diningroom table with our microwave and I've moved our telephone stand to make room for my ironing board. It's a tiny little space for sewing, but it works. I've purchased diaper flannel, birdseye and PUL to make cloth diapers and covers; linen and cotton for skirts for me and outfits for Junah, and a nearly unmentionable amount of accessories to make sewing faster, easier and more fun. The accessories category includes the book Sew What? Skirts. I love wearing skirts, especially during the summer when it gets so hot here. Shorts are okay but I increasingly feel like it is hard to find flattering shorts, especially if I expect them to cover my bum (I accidentally purchased a pair of shorts at Target that have "lowest rise" emblazoned on the inside of the waistband, and let me tell you, it is a good thing that shirt hems have dropped recently...). So, skirts. Love the book. I've made two skirts from it and it is so easy! 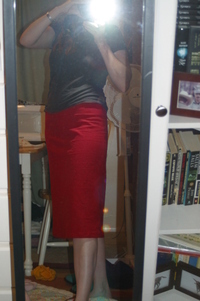 The first skirt I made was an elastic waist A-Line that was a little roomier than I like. I tend to over compensate, I think. But better than too small. 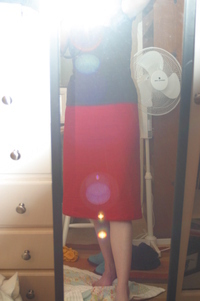 The second skirt has become my all time favorite skirt in the world. I've worn it three or four times in the week since I finished it. Actually, the first time I wore it I hadn't even finished the hem but was so in love with it that I wore it anyway (although I didn't leave my house). I used to have a love-hate relationship with the color red. My mother loved it and I hated it. A lot of my clothes were red. I remember a pair of sweats and a sweatshirt I got for Christmas one year...all red. Hated. And what has happened since? Well I was inexplicably drawn to the bolt of red linen (a linen rayon blend actually) at the fabric store. I just had to have some. And now, my favorite skirt? Red. All red. But first I need to finish a dress I'm making for this sweet girl...Talk about love. I've been meaning to write this post for sometime, however, I'm still not very proficient at one-handed typing, and I generally only have one hand free when I'm in front of the computer. But, I'm going to try. I'm pretty happy with the fact that I managed to start and complete five projects in the eleven weeks* since my daughter was born. Yes, two of those were washcloths, but hey, they count any way. And two were pairs of socks, which, if I counted per sock, ups my total to seven. But the project I'm most proud of is Junah's Easter top. In late March I posted about wanting to recreate this outfit for Junah. I'm not so good at the sewing thing, but fortunately, my sister Jesse excels at it. While I was at the fabric store buying the pattern for the pants, I spied some beautiful fabric that I thought would be perfect. However, since I was still messed up on postpartum hormones, I didn't buy the fabric but just wrote down what it was, thinking I would send Jesse in to get it and confirm that it was as perfect as I believed it to be. Mistake. She loved the fabric, and was able to see a skirt the fabric store has made out of it as a model, but there was none left. None of our local fabric stores had it in stock. I ended up ordering it from The Heart of Dixie in Alabama. Along with some coordinating fabric, for the heck of it, and some Elvis fabric, because my Nana loves Elvis and I'm hoping to make her a tote bag for her birthday (in July). She might get a kick out of it. Or she'll think it's too silly. We'll see. For the top, the knitted part of the outfit, I purchased three balls of Debbie Bliss Baby Cashmerino in a beautiful light green color. I was able to get the book for the top, Debbie Bliss' Baby Knits for Beginners through my library. The pattern is actually for a "Dress with Eyelets" calling for Wool Cotton (which has the same gauge as the Baby Cashmerino). Since I wanted the dress to look like a long shirt instead of pants I decided to shorten it. Knowing that math would be involved in that, and still being loopy from the hormones, I delayed casting on because I was worried about trying to figure out how to shorten it and convert it to an in the round pattern. Eventually I just went for it, figuring that where the pattern said "knit until piece measures so-many-inches" I would just reduce the called for number of inches. Not the best way, since the dress is knit from the bottom up I should have, I realized later, cast on a fewer number of stitches and done fewer decreases on the skirt portion. Oh well, another lesson learned. It seemed like a couple weeks went by and, despite my best efforts, the dress didn't get any bigger. A round here, a round there, made no difference. I didn't think I would finish. About a week and a half before Easter I decided I really needed to get going and spent a lot of time knitting while my daughter napped on my lap. Things went well, and more quickly, as the number of stitches decreased as I reached the eyelet row and neared the armholes. I worked the back first, and noticed, and corrected for, the yarnover for the buttonhole seemed one stitch too close to the edge. Instead of binding off at the shoulders I held the stitches on stitch holders to be grafted with the front stitches later. The front was a bit trickier since each shoulder strap had decreases on the armhole side and neckhole side and I was trying to get it to match the back which I had fudged a little in order that the entire shirt be the length I wanted. But, I persisted, and early in the Easter week, kitchenered the shoulder stitches. I then wove in all the ends--there were a lot since each side of the neckhole, on both the front and the back, is worked by itself. Once I had done all the nasty end weaving in work I picked up stitches for, and knit, the edging for the neck band. Feeling ever so accomplished, I held up the piece, complete except for the armhole edging, and smiled. And stopped smiling. 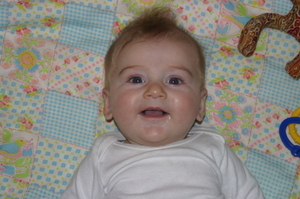 The neckhole had about a six inch circumference for my daughter's fourteen and a haf inch head (at birth) to fit through. In a panic I ripped back the neck edging and cursed my stupid efficiency. No way I was going to unpick all those woven in ends. In a brief moment of wisdom I put the thing away and went to bed. Tomorrow is a brighter day and all that. The next morning I got out my sewing shears and hacked into the top after picking up a row of stitches on a US #1 DPN. Have I ever mentioned how useful I find my #1 double points? I use them often, mostly for picking up stitches after I've had to rip back, or for casting on for a toe up sock. They're great for these things. I think the fact that they're bamboo is crucial, since my metal pair would just slide right out. I usually keep at least two of the needles in my little knitting tools bag, along with my tiny scizzors, stitch holders and markers, tape measure, etc. Anyway. I did a little math and some quick measurements on Junah, and figured out that if I left out the decreases on the armholes and just did the neckhole decreases, adding a few decreases to end up with the required number of stitches, the darn thing had a chance of going over her head. And you know, it worked. Just barely. I did have to gingerly ease the top over her ears. A handpainted wooden button that cost me five dollars (since it came in a pack of ten or so buttons, but I just had to have it) and a purple ribbon, along with the super-cute pants super-busy Aunt Jesse stayed up late the night before Easter making, completed the ensemble. And I, of course, forgot to get good pictures of her in the outfit the day of, and so I dressed her up in it again a week (or three, I can't remember) later. 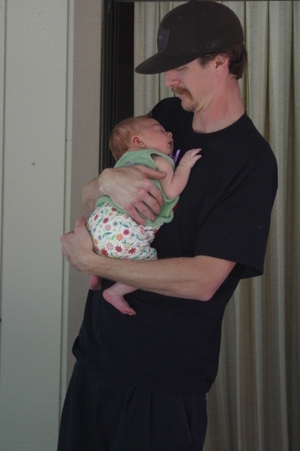 I did get this picture, however, of our sleeping girl starting out on her first Easter egg hunt, in her daddy's arms. 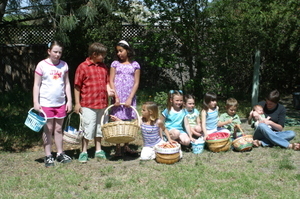 In our family all of the kids line up inside after the (hundreds) of eggs are hidden and the youngest goes first. And since Nana loves to see pictures of all the great-grands together on Easter, Junah was literally taken from my breast after cries of "Junah! Junah!" (think "Encore! Encore!") made me laugh and give her up for this photo. Of course, she needed a little help, hence Aunt Maddie, not a great-grand, just a grand, is in the photo too. 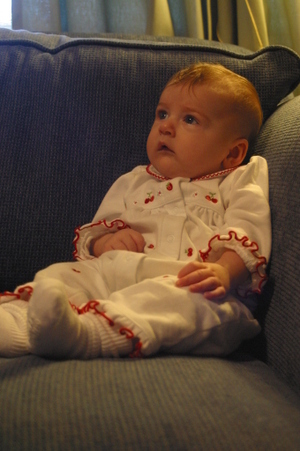 As I finally finish this post I hear my daughter, who is fifteen weeks old today, waking up. 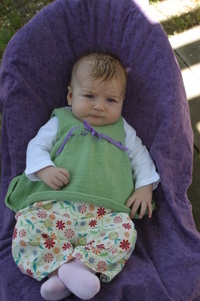 Inspiration for this outfit came from SouleMama, a blog I discovered around the time Junah was born. It is wonderful and maybe a large part of the reason my diningroom has turned into a sewing room recently.